SkyDancers.com Tents are a great way to provide shade to a large group of people or objects, while at the same time promoting your business or event with colorful logos or messages. Lightweight to transport and store, easy to assemble and disassemble, and available in various shapes, sizes, colors, and designs; you'll definitely find the right Tent inflatable product in our lineup. Whether for a sporting event to provide shade to a team full of ball players, or to provide shade for food products outdoors; you'll find multiple uses for your new SkyDancers.com Tents. Call us today to find out which one of our Tents suit your specific application need. 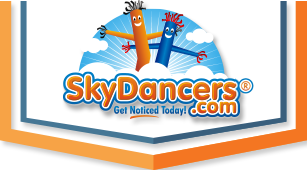 Our SkyDancers.com Tents are compatible with only SkyDancers.com 1hp Giant Inflatable Blower. The Tent Promo Inflatable comes with a custom cover and harness set to tie down to the ground. Easy and quick assembly and disassembly is our mantra when it comes to all our products. All you need to do is attach the Skydancers.com Giant Inflable blower to the tent, power the blower on, and watch the tent inflate in a few short minutes. Be sure to use the harness tie down set to keep your tent in place. And once your through with the day's use, transport is quick and easy with the products light weight.